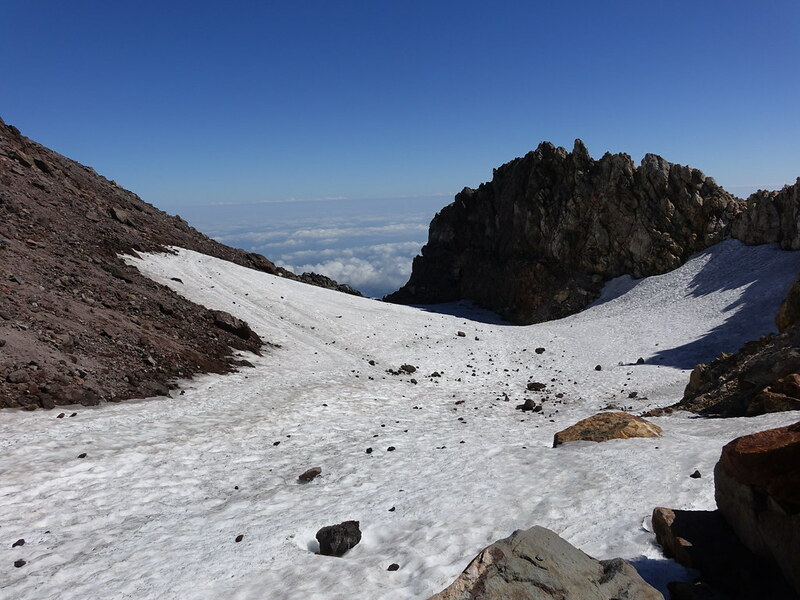 After Mount Taranaki I wanted to climb Mount Ruapehu. Mount Ruapehu is the highest mountain on the North Island of New Zealand at 2797m (9177ft). It is situated on the central plateau of the North Island near to Mount Ngauruhoe (of Mount Doom fame) and Mount Tongariro (of the crossing fame). Along its route is the town of Whangamamona which declared itself independent in 1989 in a tiff about local authority boundary changes. You can even buy a passport of the Republic at the local hotel. We were on our way to Ohakune which lies to the south of Ruapehu. As we reached the central plateau, a line of volcanoes faced us. First there was Mount Doom (sorry, Ngauruhoe). This was about the best view of Ruapehu that we were going to get. I had allowed for two or, possibly, three days to climb it. Unfortunately, Tropical Cyclone Fehi was on its way. So the forecast was not good for the next couple of days. So it turned out. The main impact of Fehi was on the South Island where there was much damage and a couple of deaths. For us in the centre of the North Island strong winds and occasional downpours associated with a frontal system came in with the storm. 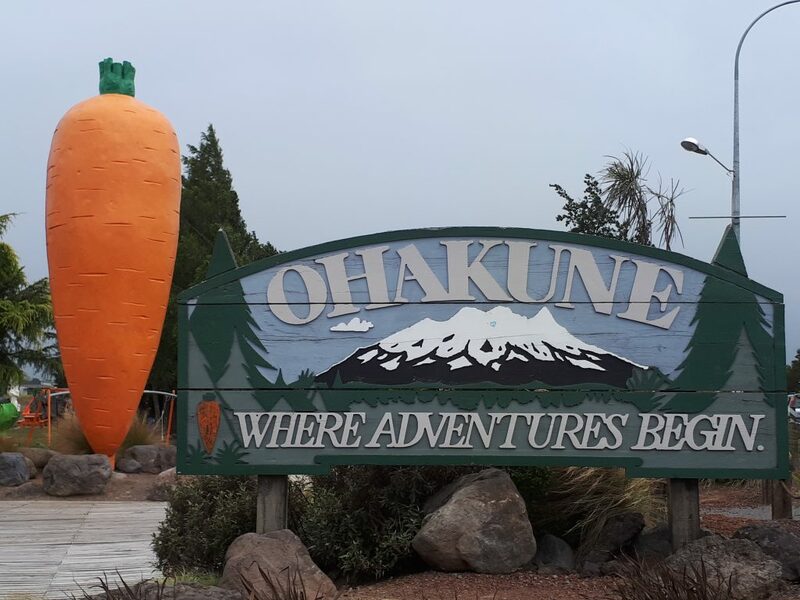 Ohakune, in the New Zealand winter, is a ski resort. Otherwise its claim to fame is that it is in the centre of the country’s vegetable growing industry. There is only so much time you can kill drinking coffee in cafés and reading. So we were forced to brave the weather and visit the town’s main attraction. So there you go. That’s Ohakune. In undertaking my research for the Ruapehu climb, I had found very little on the internet. Any information that there was normally related to approaches from the north west and the ski centre at Whakapapa. 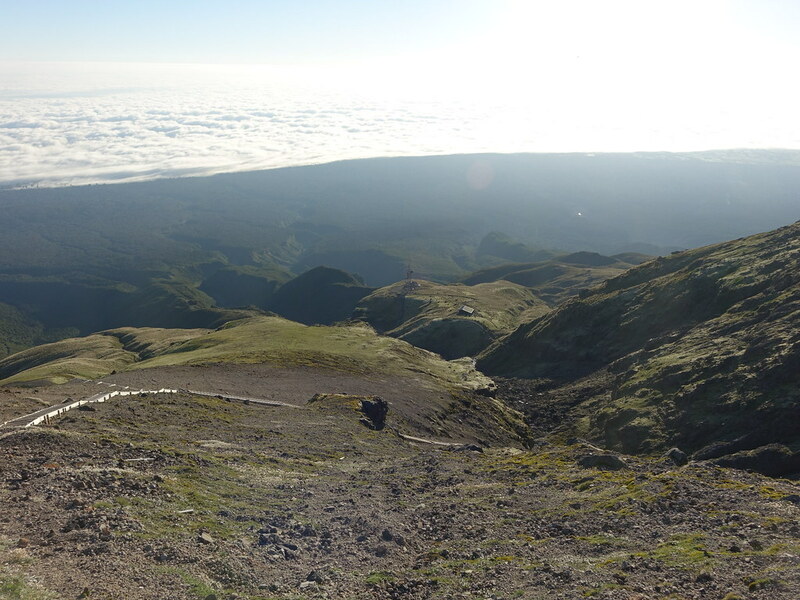 These approaches take you to the northern edge of the crater but not to the summit. Though you can buy one way lift passes on this side which can help. One of the main features of the mountain is its crater lake. 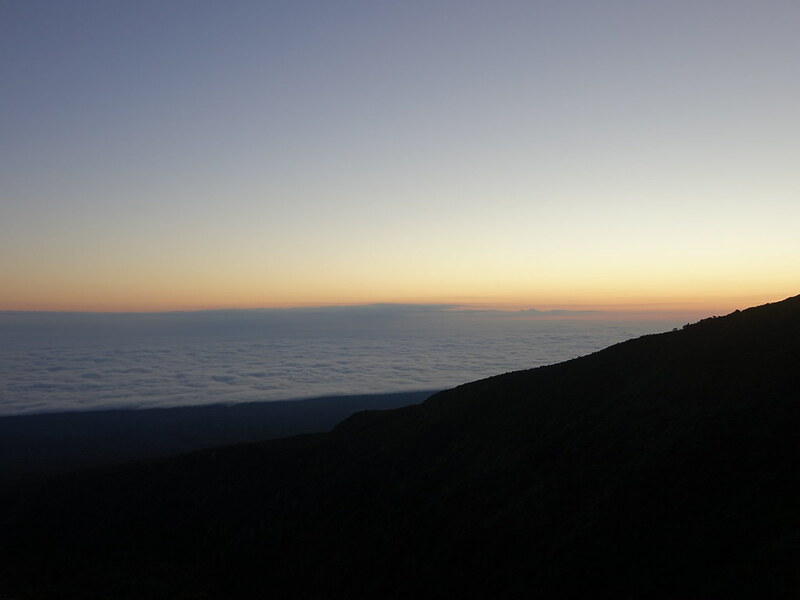 It is well seen from any point of the crater rim. From the northern approach the summit is some way around the crater. Ruapehu is regarded as an active volcano. During eruptions the crater lake tends to disappear and the mountain is famous for its lahars (mudflows or debris flows that follow valley bottoms that comprise pyroclastic materials, rocks, water and hot gasses). So I guess that the tourist authorities steer people to the more relatively safe parts of the mountain. There is a decent route from the south though. From Ohakune there is a ski road to the resort of Turoa from where a start can be made. The forecast for the day after the main impact of Fehi was a little better. Predicted 60kph winds and dry giving way to lower wind speeds and showers. It looked as promising as it was going to get over the next few days. So I decided to go for it. At around 8am on a grey and blustery day Julie dropped me off at the deserted Turoa ski centre. I was a little nervous venturing out by myself on a mountain covered in cloud in a country that I was unfamiliar with with an unpromising forecast. But I had map, compass and GPS with me. Julie left to check out of our accommodation and I followed the service road beyond the lower ski buildings. I was soon passing a substantial lagoon used, presumably, for snow making purposes. Left and right of me, looking like forlorn daffodils, were the heads of a lot of snow making machines. By the time I reached the Winter Garden at the foot of the main lift system I was in cloud. With map and GPS I navigated using the ski lifts as handrails. The service “road” continues beyond where shown on the map and winds its way upwards. I had originally intended to find the lower end of the Skyline Ridge and work my way up from there. However I changed my mind when I reached the bottom of the Gliding Gladys glacier. The Skyline Ridge divides two glaciers, Gliding Gladys and the much larger Mangaehuehue Glacier. In fact Gliding Gladys is quite a narrow glacier and as with many glaciers in the world in retreat. It is also free from crevasses. By now it was distinctly unpleasant in wetting heavy drizzle and strong wind. I strapped on crampons and got out my ice axe, both of which I had brought from the UK. I was able to make good time up the snow of the glacier. With the rain and the above zero temperature, the surface of the glacier was pretty good for the crampons. It was a bit of a head down affair so as to keep off the worst of the rain. At a steepening of the glacier at around 2450m I decided that the snow was becoming too firm for comfort so I resorted to the rocks to my right to decrampon and have a quick bite to eat. From that point I made a rising traverse towards the skyline to my right, just visible through the clouds. This was over a mixture of loose rock and very grippy volcanic slabs. At a couple of places there were some short sections of easy scrambling. That skyline was the ridgeline of the Skyline Ridge. I edged my way up the Ridge. To my right I could see the top of the Mangaehuehue glacier. At around 2750m the ridge suddenly narrowed. Without the wind this would be a pleasant airy situation. Fortunately, I managed to avoid the wind blowing me off. Perhaps I was imagining it but the wind speeds seemed to be dropping though I remained in cloud. I soon reached the summit, known as Tahurangi, after then. Unfortunately there was no view to be had. At least the rain had eased and the wind was bearable. The cloud threatened to peel away from time to time with the occasional blue patch appearing above. But it never lifted. So I never had a view of Crater Lake beneath or of the crater rim beyond the immediate vicinity. Here is a short video showing the conditions. I waited a while wishing the cloud to lift. I wandered along the crater rim for 50m or so to check that I was at the high point. After 15/20 minutes I started to get cold so I left, abandoning my hopes of a view. My return route was much the same though I aimed for access to the glacier higher up. There seemed to be less of the annoying loose rock, or perhaps I was just managing it better. Again I made quick time once on the snow. The only slightly disconcerting element was the number of small stones on the surface of the snow – so rockfall may be a risk to be aware of with this route/approach. As luck would have it the summit cleared about an hour after I had left it. But the clearance was brief and clouds soon enveloped the summit again. It was now also dry. By the time I reached the bottom I too was dry. The wind speeds had not dropped as much as promised. Here are some shots up and down the glacier and of some red rock. I do not think that I have seen so much red rock on a volcano. The Gliding Gladys glacier is the long ribbon of snow to the right and the Skyline Ridge is to the right of the glacier. I was a little faster on the climb than I had anticipated and was able to take shelter by one of the locked ski buildings whilst waiting for my lift back to Ohakune. That was fortunate because I arrived there just before the clouds moved in again and a torrential downpour developed. So again it was a successful summit in a bit of a weather window. The following day was brighter. But the winds had strengthened again. As we drove north to Lake Taupo the highest points remained covered in cloud. A glance at a map of the North Island of New Zealand will reveal a bulge on the west coast perhaps a quarter of the way up from the bottom. This is balanced by a peninsular jutting out from the east coast a little to the north. This marks a line of volcanic activity. In the middle of the west coast bulge lies Mount Taranaki, a stratovolcano which rises to 2518m (8261ft). Because of its isolation from other major peaks, it has a good deal of topographical prominence. 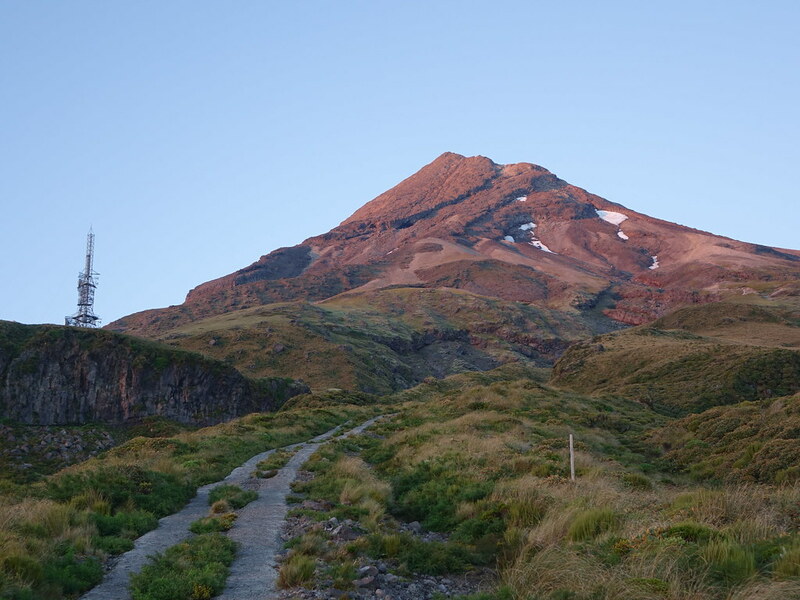 Mount Taranaki is also known as Mount Egmont, the name given by Captain Cook on his antipodean adventures after the 2nd Lord Egmont who was a former First Lord of the Admiralty. Taranaki is a Maori word meaning shining mountain, presumably because of the snow that caps the peak year round. 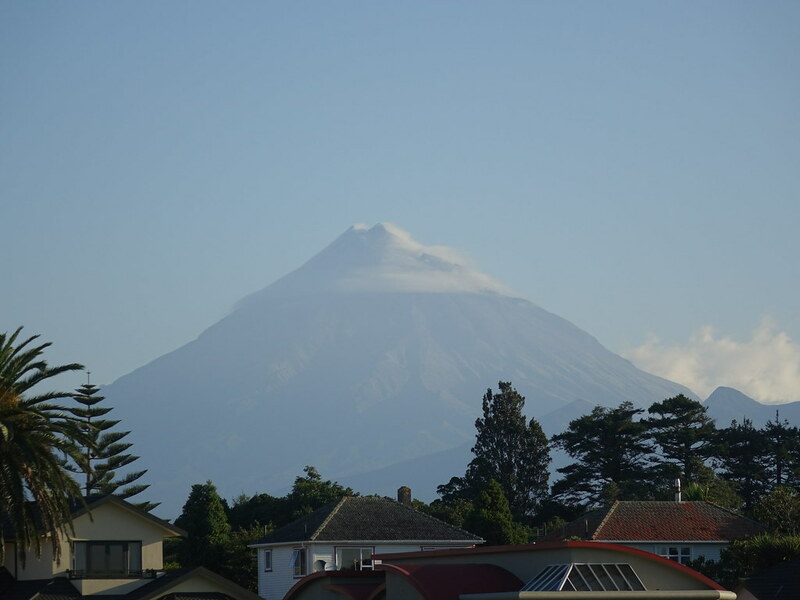 The volcano that is Taranaki is currently dormant, but it has had significant activity within the last couple of hundred years. Apparently Taranaki is one of those volcanoes where an eruption is “overdue”. From many angles Taranaki forms a beautiful cone. To the south east the perfection of the cone is disturbed by a secondary cone, Fanthams Peak. The nearest significant mountains lie about 130km (80m) to the east where the volcanoes Ruapehu, Nguaruhoe (Mount Doom of Lord of the Rings’ fame) and Tongariro rise from the North Island’s central plateau. Lake Taupo (an ancient caldera) and Rotorua are further north and continue the volcanic theme. Taranaki had been an objective of mine in planning our trip to Australia and New Zealand earlier this year. 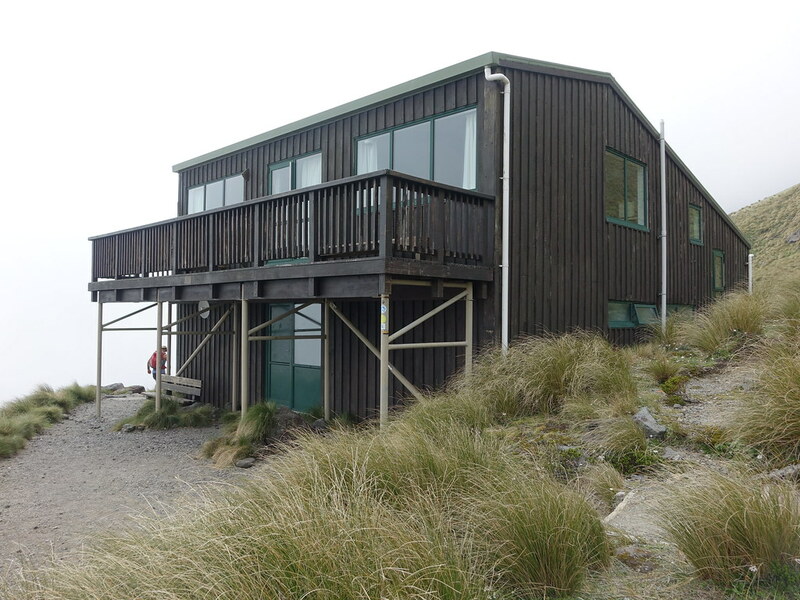 It is a relatively straightforward climb in good conditions and may well be the most climbed mountain in New Zealand. The mountain is, however, subject to the vagaries of the weather coming off the nearby Tasman Sea. Significant numbers of people have died on the mountain, normally as a result of being caught out by fast changing weather. 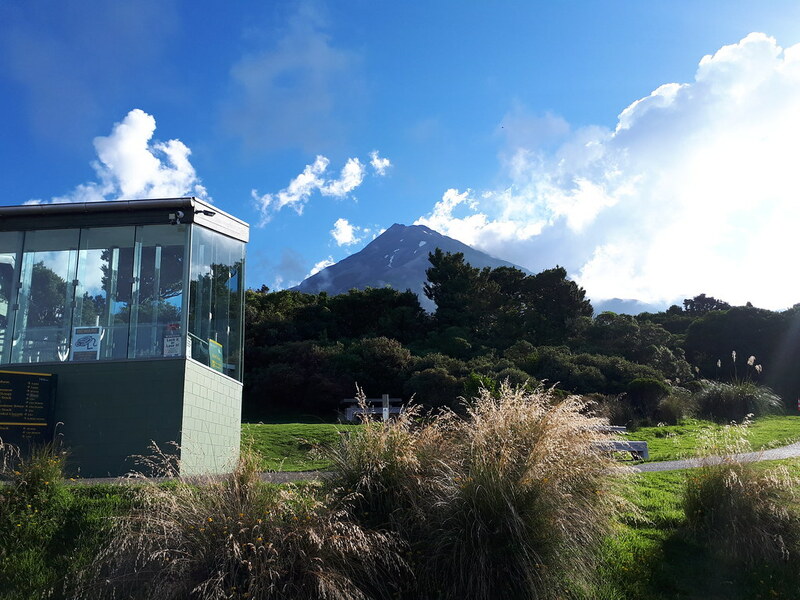 One other interesting fact about the mountain is that, in negotiations between government and local Maori tribes that concluded only a few weeks before my visit, it was agreed that Taranaki would be given the same legal rights as a person. The new status of the mountain means if someone abuses or harms it, it is the same legally as harming the tribes. The tribes believe that granting this “legal personality” will offer better protection to the mountain. The area is experiencing more tourist numbers after Lonely Planet named the Taranaki area as the second best place in the world to visit in 2016. We drove to Taranaki having spent a pleasant long weekend in Wellington with friends. As we headed for the small town of Inglewood that lies at the foot of the mountain, low cloud capped the mountain. Indeed you wouldn’t have known it was there. But I was hopeful because the forecast was promising a clearance. Having checked into our accommodation at the White Eagle Motel, I thought it might be sensible to drive up to the start point for the climb that evening because I would be setting off in the dark the following morning. There are a number of start points, but the most popular is probably that at North Egmont. Here there is a large car park and visitor centre. As we arrived the cloud was breaking up and Taranaki was revealing itself. The car park was also fairly full with vehicles of all kinds parked up. It was clearly going to be a busy day on the mountain in the morning. The following morning I was at the car park by 5.30am having driven through fog on the way. There was a little, though not much, activity in the car park. Indistinct figures were preparing their breakfasts around a few lit stoves. I had prepared my gear the previous evening, so after putting on my boots, I was away in the dark by 5.40am. I did not use my headtorch. Signs clearly marked the way. A road, rough at times, climbs up towards a transmitter tower. There is a hut (Tahurangi Lodge) a little above. I caught up with another guy, a French lad who I would tag most of the way up the mountain. It took me about 1 hour 20 minutes to reach the hut. Here I had a brief rest with the French lad to fortify myself for the next section. 20 minutes earlier the sun had risen. This revealed that the fog I had driven through earlier was in fact a sea of cloud that floated now way below, neatly lapping at the lower edge of the forest that ringed the mountain. The air was still under the blue sky above. There was just about enough chill in the air to avoid overheating. The sun made the summit above glow. The next section took me up through a rocky ravine to the bottom of the infamous wooden staircase. Each of these sections take around 15mins. The staircase is there to reduce erosion but it dumps you at the foot of 400m of scree ascent. Enough said. You make the best of it. I passed, coming down, 4 people who had been on the summit for the sunrise and briefly chatted to each of them. Here was the view down towards the hut and transmitter with the line of the wooden staircase clearly visible. After 40 minutes of purgatory on the scree, I reached the bottom of a feature known as the Lizard. This is a rocky rib that runs up to Taranaki’s crater. The Maori lore is that this rib is the tail of a lizard that is crawling into the summit crater. I had another brief stop at the tip of the tail. From this point the conditions under foot do improve though there is still a significant amount of more easily avoidable scree. But I steadily made my way up following metal poles that indicate a way upwards. There is some easy scrambling to be had if you want it. The weather remained great. 400m of further ascent took me to the narrow entrance to the crater. A narrow ledge above a cleft brings you the crater proper. 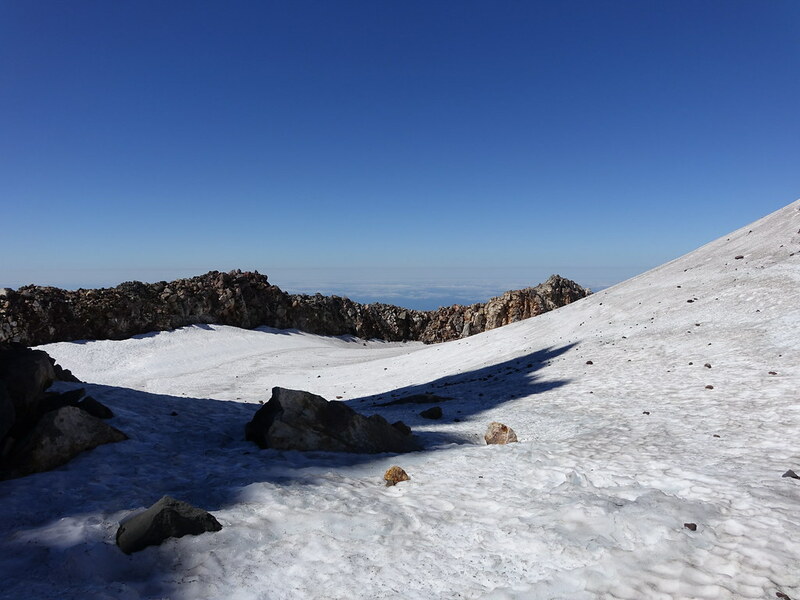 There is permanent snow in the crater. 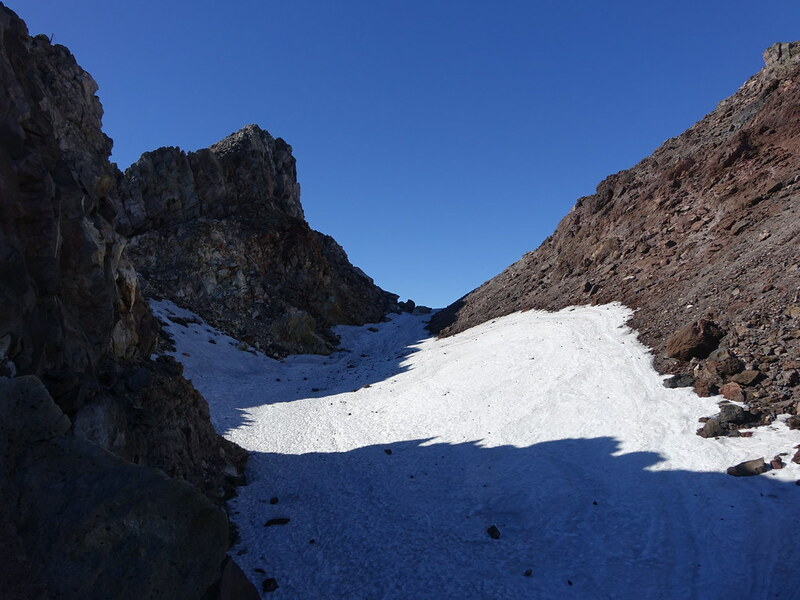 In summer this melts out a bit and it is necessary to make a short scramble down into the crater and onto the snow. The snow was firm and in part icy but I did not need the crampons that I was carrying. Once in the crater I was in the midst of a rocky vice. To the left was a rocky sub-peak. To the right is the main summit. The crater snow rises to form a little col between the two peaks and on the other side of the col is the other half of the crater which is open to the west. The final climb of 75m or so up to the main peak is another scree-fest. The true summit is near the top of the final climb. 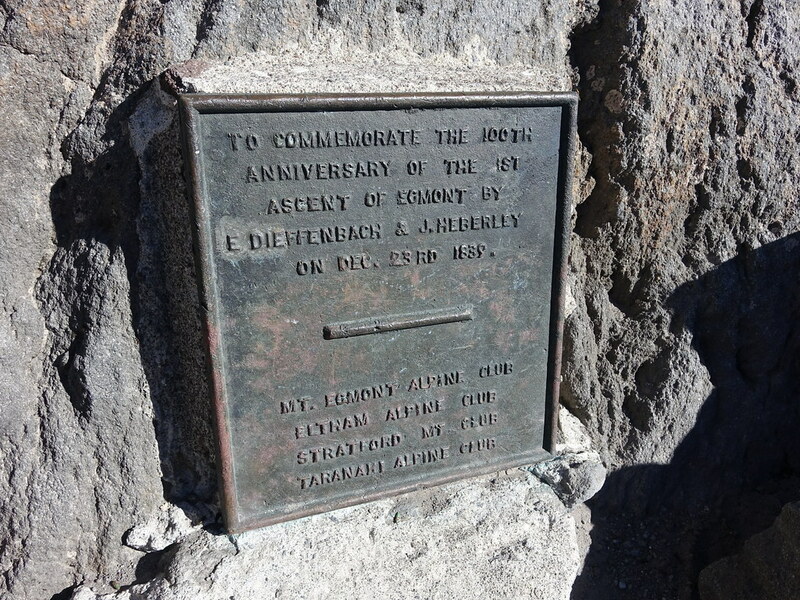 A plaque commemorates the first European ascent in 1839. I reached the top at 9.45am. 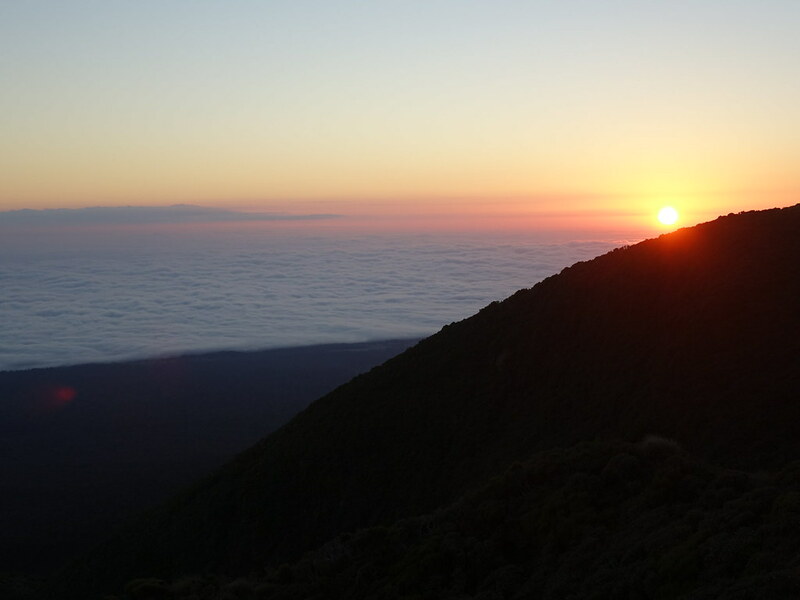 By now the sea of cloud beneath was breaking up as this short video from the summit shows. 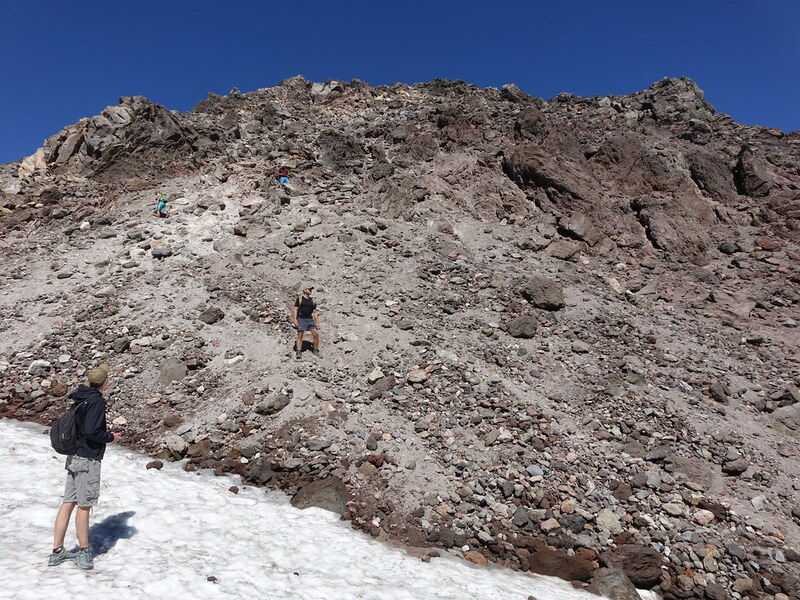 Most of the other climbers had congregated at the far end of the summit. So I went over to join them. I spent a very pleasant 40 minutes there looking at the views and munching on some food. Cloud occasionally wafted over the top in the light breeze and the air chilled then. But it soon passed on. The volcanoes to the east seemed to be suffering a little weather with clouds banked up over there. To the west, cloud still largely covered the sea. The city of New Plymouth lies on the tip of the bulge about 30km away. That was where Julie was, thinking that I was having a poor weather day because all she could see was the layer of cloud above her. Little did she know! It was, unfortunately time to leave. I skittled down the scree into the crater and had a brief wander around. Here is the south side of the crater. And the north side through which I ascended. The descent followed the route of ascent. Now there were streams of people ascending. The summit would be crowded and the weather was slowly getting worse. I stopped again at the bottom of the Lizard’s tail and at the hut for brief rests. Going down the scree was no more pleasant than ascending it. It wasn’t fine enough to scree run. 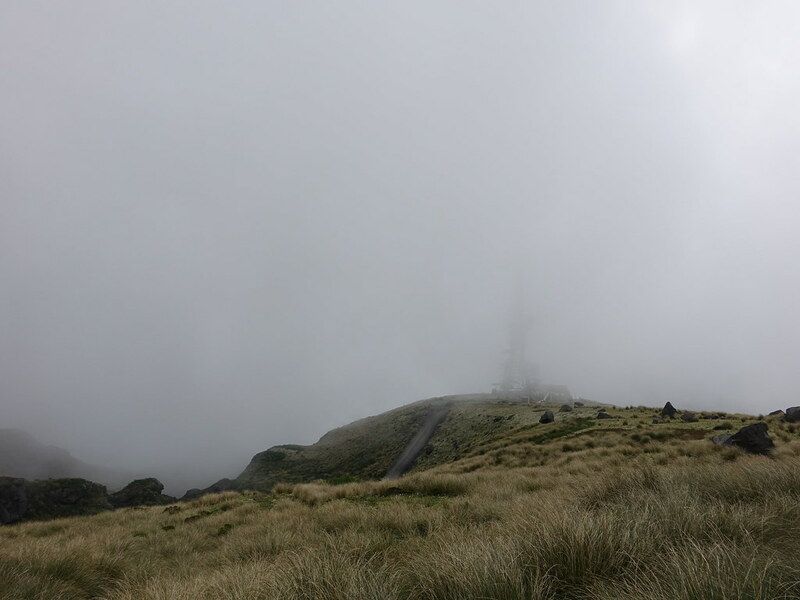 Reaching the staircase was a relief and soon I was descending into cloud to the transmitter mast. I was back down at the car at 1.35pm. 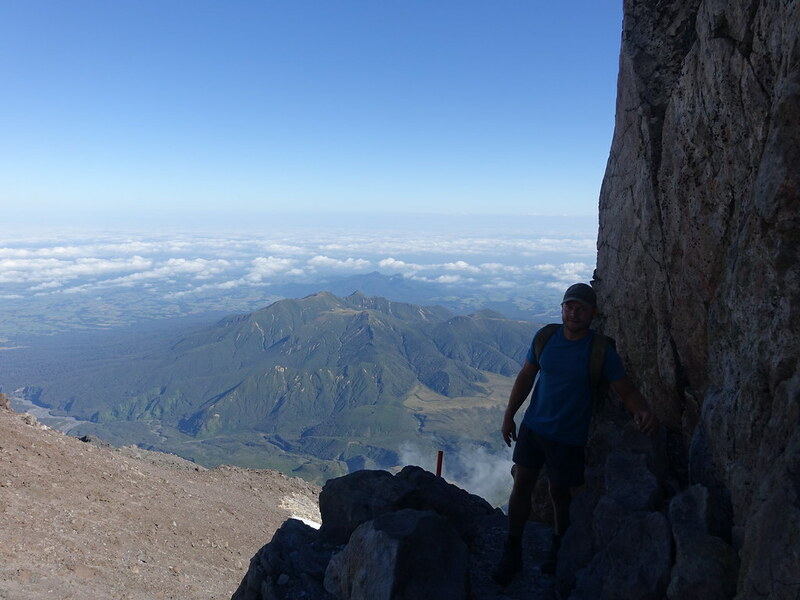 Taranaki is a great mountain to climb, especially on a day such as I had. In winter conditions it is a different proposition entirely. And by the following morning the mountain was blanketed by cloud again. So I was lucky to catch the weather window I had.